Right away, you must know: we haven’t seen the original Dad’s Army show. While we’re certainly aware of it – we’d have to be, especially with this new movie – it’s one of those classic shows that everyone loves but we just haven’t gotten around to actually watching (though, what little we have actually seen of it has been pretty funny). So, when we’re taking about this new film, adapted with an all-new cast and updated as where necessary, it’s completely without bias and without endless comparison to the original material, like a lot of reviews for this film are undoubtedly doing; we’re reviewing it, as we do most of the movies featured on this website, as a movie in and of itself. And unfortunately, Dad’s Army circa 2016 is a major misfire whichever way you look at it. From what we can gather, the basic set-up is still the same as it was – a group of aged and inactive soldiers form the Home Guard in WW2-era Walmington-on-Sea, and try to make the most of their inactivity despite their foolish nature – as are the majority of the characters, including Captain Mainwaring (Toby Jones), Sergeant Wilson (Bill Nighy), Lance Corporal Jones (Tom Courtenay), Privates Godfrey, Pike and Walker (Michael Gambon, Blake Harrison and Daniel Mays respectively) etc. However, the major difference in this film seems to be the arrival of Catherine Zeta-Jones as a reporter supposedly sent to write about the Home Guard, as well as a sub-plot that sees a German spy within the area that’s reporting their findings back to the Nazis (and yes, it’s EXACTLY who you’re thinking it is right now; a fact that the film thankfully doesn’t hold back for too long). The film has the fortune of having a really strong cast of actors being brought in to play these parts; they all do fine work with what they’re given, with Gambon in particular having a lot of fun playing the lovably senile Private Godfrey, and while some of them appear to be brought in solely for their uncanny resemblance to the past actors – Jones, in particular, looks almost a dead ringer for Arthur Lowe and his spectacled and hapless Captain, from what we’ve seen of the original anyway – they manage to make it work as their own thing. Sadly, not even the talents of these wonderful actors can save the fact that, by most accounts, this is a poorly-directed movie. Oliver Parker, perhaps best known for the St. Trinian’s movies and more recently the quickly-forgotten sequel Johnny English Reborn, seems to have decided to play things mostly serious, like a straightforward wartime drama with an excellent British cast that happens to occasionally do a bit of slapstick every once in a while; as a result, the tone is wildly off, and said moments of comedy in this otherwise straight-faced movie feel very out of place and, most offensive of all, painfully unfunny. Even without having seen the show, we recognise that Dad’s Army is first and foremost a comedy, with the kind of British humour that is highly-regarded even to this day and a major influence on most sitcoms that came after it; and what Parker seems to have done is take out the humour and just placed the characters front and centre, which is a noble thing to do but with something like Dad’s Army you need the comedy there as well to back them up, because these characters are honestly not strong enough to carry a movie on their own backs. 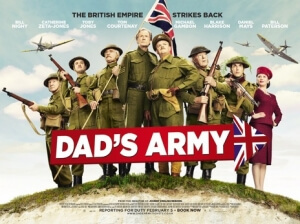 By removing the comedy element and playing things more straight than they need to be, Parker has taken away one of the defining elements that made Dad’s Army memorable in the first place, and thus it comes across more as a pale tribute show rather than the actual thing. It’s telling that the audience is in for a mostly dull ride when an opening scene with a bull, which the Home Guard are tasked with recapturing, is played so stiff and unenergetically that you end up being distracted by the many ways you’re thinking of how it could be so much funnier. It positively sets up the rest of the film, which continues to be just as boring and lifeless even for a cast of near-septuagenarians; the character arcs, which all seem to consist of creepily lusting after Zeta-Jones (though to be fair, she’s probably used to the attention from older men by now), are not at all interesting, the “twist” honestly benefits even less from being revealed too early in the film since you spend the rest of it waiting for the rest of the cast to catch up with you, and although there are some sporadic chuckles placed throughout – most of them coming from Gambon – the film ultimately fails to be consistently funny even when it’s trying. You’re basically stuck there for 100 minutes being endlessly bored, not caring at all about what’s going to happen or to whom, and just wanting it to be over so you can get on with other things. That’s the real tragedy of Dad’s Army circa 2016; to the uninitiated, who (like us) have never seen the show and are seeing this movie with fresh eyes, they will be put off by the film’s lameness that they won’t even bother to check out the original. We at least had the fortune of seeing a little bit of it before watching this film, and finding it relatively funny; but this film promotes the original series so poorly that it’s likely to put people off watching it even more. It’s a shame, because it does genuinely look like it’s a genuinely fine show, but then there are films like this that ruin the excitement for everyone else. Dad’s Army is likely to heavily disappoint fans of the original show and strongly put off anyone who hasn’t, because it plays like a lifeless and unfunny tribute band more than the actual thing, with some poor direction that completely nixes the essential comedic tone which also makes it extremely boring to watch, despite the genuine talent on display with its cast.